As the nation’s largest Internet service provider, Comcast is spearheading an ambitious and comprehensive broadband adoption experiment called Internet Essentials. The goal of Internet Essentials is to help close the digital divide and ensure more Americans benefit from all that the Internet as to offer. It is available to families with children who receive a free school lunch as part of their enrollment in the National School Lunch Program in more than 4,000 school districts in 39 states plus the District of Columbia. • Access to free digital literacy training in print, online or in-person. Internet Essentials customers also receive Norton™ Security Suite ($160 value) for comprehensive online security, at no additional charge. • Does not have an overdue Comcast bill or unreturned equipment. Comcast will accept new program participants through the end of the 2013-2014 school year. 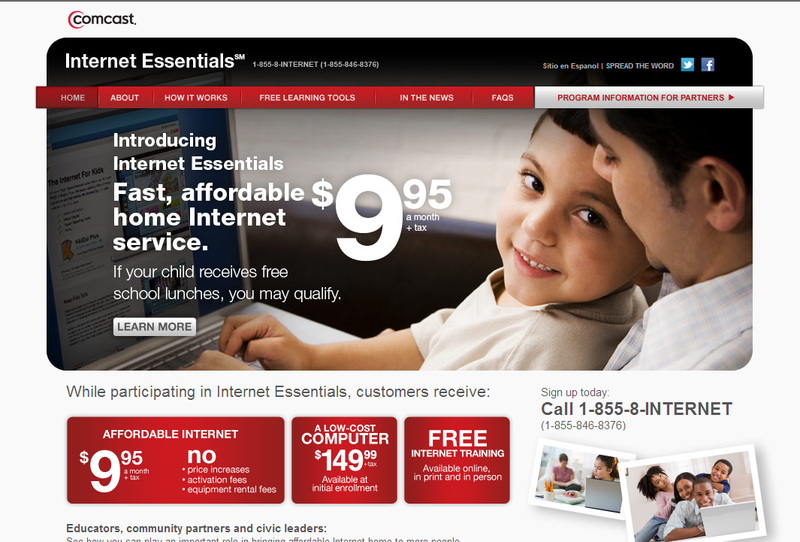 For general information about Internet Essentials, visit: www.InternetEssentials.com (for English) and www.InternetBasico.com (for Spanish). For educators or community-based program leaders, visit: www.InternetEssentials.com/partner. For parents looking to enroll in the program, call 1-855-846-8376 or for Spanish call 1-855-765-6995.